Capcom's Devil May Cry (DMC) series has had a roller coaster of different games throughout the years that range from thrilling highs to some really depressing lows. DMC3 has been the climax of the series for quite a while and remains the supreme DMC to be compared to when all the DMCs after it were released. The original DMC series has been dormant for the past 11 years and DMC5 is the first actual sequel to the original series. 2013's DmC: Devil May Cry was an attempted reboot that was actually good, but really unneeded considering that DMC4 was not headed in a bad direction. DMC5 picks up where DMC4 left off and does a damn good job in taking the story in a new direction and giving us new gameplay mechanics to work with. DMC5 is just as much of a stylishly hard action game as the prior games in the series and I really feel it's just as good as DMC3. In DMC5 we start out with Nero as the main character once again. A tree has sprouted in the human world and a new demon king (Urizen) has come to power. Urizen wishes to feed the tree so that it will grow fruit that will give him ultimate power once he eats the fruit. From the start, we are hoisted into a great battle that sends Nero and newcomer V back outside the tree as Dante faces off against an overpowered Urizen. Nero must work together with V in order to defeat Urizen and destroy that tree that is feeding off humans to grow stronger. The story to DMC5 is very engaging and satisfying. If you've been following the series up until now, you'll get a guaranteed smile upon your face with some of the events and plot that unfolds in this game. DMC games have always had combat as their main focus, but they would often have minor puzzles and some platforming that would break up the combat. 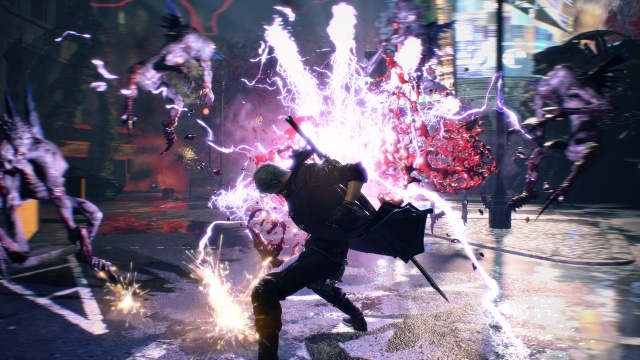 DMC5 has combat as its main (and just about only) focus. You still have your secret missions that require you to do something gimmicky and your blue orb fragments that are hidden in the environment and require you to do some careful research to find them, but aside from these series norms, there is little platforming and nearly no puzzle solving. The focus on combat works out greatly for DMC5 since its combat is easily the best in the series and it has a lot to showcase. DMC5 has some vast areas to navigate and you'll run across several areas where you're sealed off by the usual demonic wall and have to engage in combat to break it. The game is split up to where you have to play certain characters on certain stages, but on some stages it will give you the option to choose your character. There are three main characters in the story (Nero, V and Dante). The game has an online function where players that are going through other missions will show up in your mission from afar - you never meet up with the players and only get to see them off in the distance. Whenever there isn't a player available, an offline AI takes over (called "The DMC Crew"). You can rank the players after a mission and the player will get a Gold Orb in return. DMC5 plays a lot like DMC4, but the returning characters have even more depth this time. Nero's weapon setup remains the same as in DMC4, but he now has access to different Devil Breakers. Since Nero lost his Devil Bringer (demon arm), he now equips customized arms that give him new abilities. Devil Breakers are mapped to a certain button and offer a new attack. Devil Breakers have their own durability depending on the type and they will break if used too much. You have the option of instantly breaking your Devil Breaker to equip a new one or performing a super attack with the Devil Breaker that will instantly break it. Nero can equip several Devil Breakers from an equipment list, but he can't switch between them unless he breaks one to equip another. Other than the Devil Breaker, Nero has his Red Queen sword and Blue Rose gun. The Red Queen can still be powered up through the Exceed system that was introduced in DMC4. Blue Rose fires a more powerful shot now instead of rapid fire like before, which makes sense considering it is a double-barrel weapon. Nero actually gets more abilities than what I mention here, but I won't go into them because of spoilers. V is like a breath of fresh air to the usual DMC character. V comes equipped with three demons (Gryphon, Shadow and Nightmare) that he can summon in order to fight for him and you get control of them. Each demon is mapped to their own specific button. While moving V around the battlefield, you can attack enemies by tapping the corresponding buttons and also use different directions to change their attacks while pressing the button. Gryphon is more of a projectile attacking helper and Shadow is more melee-based. Nightmare is V's devil trigger. Once the devil trigger gauge fills up all the way, you can summon Nightmare and let him lay waste to your enemies. On his own, Nightmare is uncontrollable but there are some ways to control him by upgrading your skills. V can also read from a book in order to charge his devil trigger gauge, so you can actually become a bookworm during the middle of an intense battle. The only time that V can attack (on his own) is to finish off an enemy. He's hard to play at first because he is so different, but V is quite unique and a lot of fun to mess around with. He's also the most interesting character in DMC5, story-wise. Dante, oh Dante. Can you be any more in-depth!? Dante's overall gameplay setup remains the same as it was in DMC3 and DMC4, but he now has access to more weapons (devil arms). You still get your standard styles that Dante had in past games (Royal Guard, Trickster, Gunslinger and Swordmaster) that will manipulate what Dante can do with the style button. Dante has four main melee weapons and four main projectile weapons - there are actually variations of these weapons, but I won't go into them due to spoilers. Dante is still able to change between melee weapons, projectile weapons and styles on the fly using the controller. Along with the standard Rebellion sword and Balrog gauntlets, Dante gets to wield a motorcycle imbued with demonic power (Cavaliere) that acts much like dual chainsaws. Oh, and the Cerberus weapon is back! His guns are mainly the standard setup for most other DMC games (handguns, shotgun, etc) but we also get a hat that allows Dante to perform moves that take away from a player's red orb count! 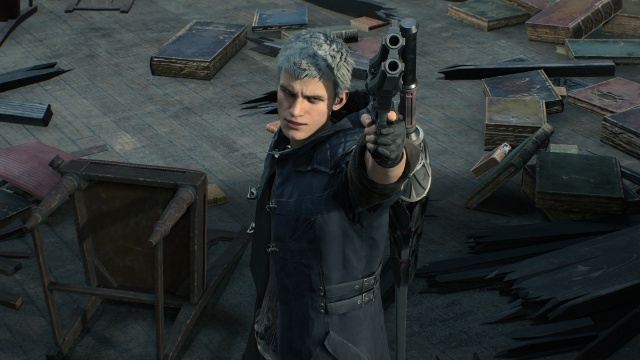 Some of the returning styles and weapons have their own unique tweaks that make them feel unique in DMC5, such as Gunslinger's Ebony and Ivory attacks - Rainstorm is much more useful than it was in previous games. Dante is just as deep and takes just as much dedication to learn as he did in past games, but this time, even more so! All characters have their own unique attitude. Nero is cocky and emotional, V is laid back and enigmatic and Dante is a playful party animal with tons of experience. Each character has their own battle music that plays as you fight enemies. Capcom has done a fantastic job in matching up each character with a good tune that defines their personality. Nero has an upbeat tune, V has some huge bass with light lyrics and Dante has grungy rock music. There was actually a rerecording of Dante's theme based on fan reaction from the original theme that was released last year and the newer recording sounds way better than the old version. The sound effects for weapons and enemies are all nicely implemented. The grinding noises of Dante's cavaliere weapon bring the weight and power of the weapon to life. The character voices are very fitting as well. There are many returning actors for certain characters, such as Nero's and Dante's voice actors. The enemy designs in the game take references from other DMC games and offer us many new designs. Some of the enemies are actually returning enemies from past DMC games - such as the Nobody from DMC1. All of the enemies are well-tuned in terms of attacks and offer some good challenge for players. Bosses can be just as aggressive as they were in past games. Many of the bosses reference other DMC games as well. One thing that is REALLY nice about DMC5 is that every single mission has some type of boss battle - whether it be a type of mini boss that later becomes a normal enemy or your standard huge boss fight, every main mission has some type of big enemy waiting for you. There is a point where we get a boss rush (with just three past bosses which are fought with a different character that didn't fight them before), but DMC5 does not fall into the series usual boss recycling phase besides that one time. It's so great to see a game that is constantly throwing new enemies at you. 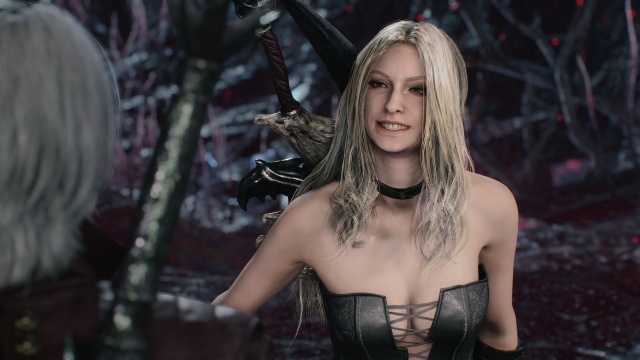 DMC5 constantly gives you new enemies and is constantly unlocking new abilities for characters as well. Once the game ends, the game has thrown so much at you at one time, I don't see how a player can avoid replaying it. In previous DMC games, the main reason to replay was to check out new skills that I had bought but in DMC5, the game actually gave me new skills after the game ends. The game starts out with only Human and Devil Hunter modes open for play - these are your Easy and Normal difficulties. By beating the game, you unlock Son of Sparda, Dante Must Die and Heaven and Hell difficulties. Just like in past games, Son of Sparda changes up the enemy setups per stage - you'll fight more powerful enemies sooner. There is also bestiary in the game that you help to fill out by defeating enemies on your way back through the game - the game takes pictures of your death blow to an enemy and displays them in the bestiary. Just like past games, DMC5 encourages replay and, with what all this game has to offer, a replay should become automatic after beating it. The game gives you several ways to earn Gold Orbs. Gold Orbs are used to revive your character after losing all health. You can also revive your character at the cost of Red Orbs. Players used to have to spend precious Red Orbs in order to buy Gold Orbs because there were very few in the environment, but you can find quite a bit of them throughout stages of DMC5 and you receive many of them just from playing online. The option to revive is more readily available to casual players now. Even though the option is available, the game penalizes a player by taking away 10% of their overall style points at the end of a stage for using a Gold Orb, so you can't get a very high ranking while using Gold Orb. The game offers a 20% increase in style points for not using a Gold Orb and not dying. Dying and continuing will give no bonus and a penalty based on the number of continues used. The game does not offer Vital Stars and Devil Stars to refill health or devil trigger unlike past games, so those penalties are nonexistent. This setup is fantastic for the overall player pool out there no matter what skill level you are, since it basically encourages you to get better but doesn't bar you from enjoying the game if you're having problems. There is so very much to talk about with DMC5 - so much nostalgia, so much WIN, so much redemption - that I could sit here and type out this review for another several paragraphs. Capcom really jam packed a bunch of content into the game - it's like you keep unlocking more as you continue to play, even after beating it. If you're a fan of the DMC series, buy it. If you're a fan of action games but have yet to try out a DMC game, buy it, because it's a good starting point for the series with its "History of Devil May Cry" video that can be viewed from the main menu. If you're a fan of DmC: Devil May Cry that is disappointed that they didn't continue off that game, buy it, because it has a few references to DmC - love it or hate it, they are there. Overall, just stop reading this review and go play it, since you're wasting valuable time in learning a character. Final Rating: 90% - Devil May Cry 5 doesn't just carry the torch of the series after DMC4, it devil triggers and flies away with that torch.